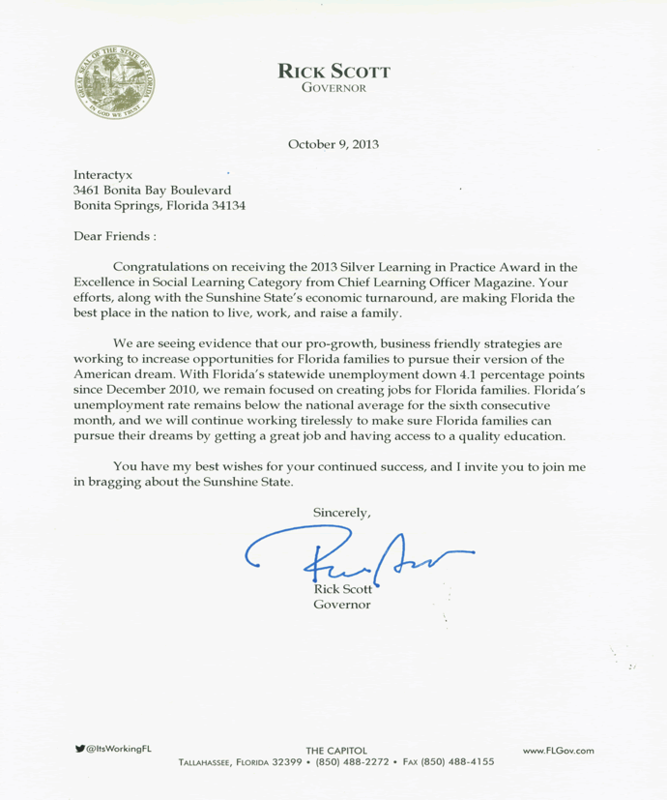 Everyone here at Interactyx are honored by the recent letter of recognition from Rick Scott, Florida Governor, regarding the 2013 "Learning in Practice" award from Chief Learning Officer magazine for our social learning management software, TOPYX®. The Learning in Practice awards recognizes industry leaders who have demonstrated excellence in the design and delivery of employee development programs. The Learning in Practice awards consisted of nominations being reviewed by industry experts and executives from some of the world’s most respected companies to determine the winners in each category. Thank you, Gov. Rick Scott. We are happy to have the Interactyx headquarters located in Florida.